The Client is a leading Real Estate Investor. The aim of the Client is to bring forth the best in cutting edge technologies to provide the users with the best in the Real Estate Search. The site breaks all barriers and limitations encountered in other Real Estate search engines and take the user to a new level of Real Estate Search experience. 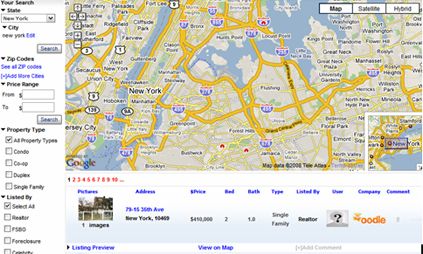 This site brings in a change the way Real Estate is searched and displayed. STPL is a leader in Real Estate Domain. It has vast experience in providing the most innovative and ground breaking technologies in Real Estate related software. STPL garners the skills and expertise to meet the objectives and aspirations of the clients in Real Estate. STPL goes through stringent and rigorous quality practices in meeting the client requirements. It follows strict quality assurance methodologies. Our quality assurance is reflected in all processes and activities of design, development, implementation and maintenance of software. STPL is certified from ISO 9001:2000. Each process is monitored and evaluated for accuracy and effectiveness at various levels. The entire possible scenario are run and tested so that there is no chance of any kind of error or bug in the product. We are constantly in touch with the customer to identify their exact needs, develop and tailor our services and solutions to ensure quality on every deliverables. This site can be used for finding rentals, reviewing landlords, buying a house, finding house values and what has recently sold in the neighborhood , can find a five star broker, using a rating system and one can also be heard by others using the Blog . Users can search a house by selecting search criteria like Zip code, Type of home, listing type, price, Number of beds etc. The search result provides with a list of the houses and also provides a map showing the exact location of the house. This feature provides users to refine their search results by selecting a refined search criterion. This feature provides functionality to search different users like Buyer/Seller, Realtor, Mortgage Company, Private lenders, Bank and Investor. This feature provides with Homes based on estimated value with low and high price range, comparison of estimated value with similar homes and sales history, Tax assessment history and more. This feature allows users to interact with each other and provide user ratings and reviews based upon past interactions. Other modules include Rentals, commercial property; Financing/Lenders provide search functionality for finding Rentals, Commercial property and Lenders respectively. Zillow.com: The application integrates with Zillow.com to provide market value of the properties in the neighborhood of a given property. was challenging and innovative. The latest and most advanced technologies are to be used and deployed to provide a user friendly experience. Users are able to access the database of over 2 million properties for sale. These properties come from agents, foreclosure sources, classifieds, for sale by owner and other listing providers. These feeds come from different sources in different formats like XML, CVS, EXCEL, XML RPC etc as shown in the fig below. All this data has to be integrated into a single format so that users can access this data through single search. 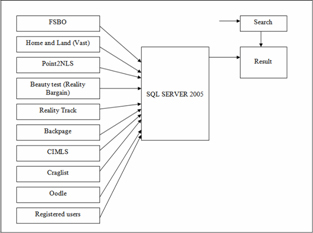 The data coming from different feeds in different formats are parsed and placed into a single centralized database as shown in the fig above. This data is updated periodically. Millions of data feeds coming from different feed providers were updated on an average of 2 minutes .This is accomplished by using the latest technologies in scheduling and parsing.